The most obvious feature of this wild animal is the black strip that extends across the raccoon’s eyes, cheeks, and snout. They are a grayish brown color with a bushy tail that consists of alternating light and dark rings. Animal control and wildlife control companies spend a lot of time trapping this nuisance animal. Anywhere there is a food source, there’s a high chance a raccoon may be lurking around. Because they are omnivores they are attracted to an assortment of foods that can come from anywhere such as a garden or even garbage that has been left out. Raccoons never really run out of habitat. Raccoons can live just about anywhere for example: dens, hollow trees, homes, and even your chimneys. Damage to gardens may be minor compared to the damage a raccoon can do to your home. Females that search for nesting sites may rip off shingles, fascia boards, or rooftop ventilators to get into the attic. Once they access your attic, insulation on walls may be torn up and displaced, and insulation on heating and air conditioning ducts may be ripped off and destroyed. 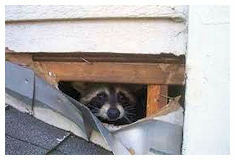 At first signs of a raccoon visitor, it is important to Call Metro Guard before expensive damage can occur. Raccoons are known to carry a number of diseases and internal parasites. The raccoon roundworm, is an infection spread to people by the accidental ingestion or inhalation of roundworm eggs that come from a raccoon’s feces, this has caused increased concern in recent years. Roundworm infection can cause serious disabilities, and young children have been more prone to picking up this infection. Raccoons are also carriers of rabies so they pose a danger to pets and people. Raccoons can also carry fleas and ticks. Metro Guard’s Wildlife Control Specialists can solve your problem with their vast knowledge of raccoon trapping. The sooner you get a specialist out to your home the better since raccoons can inflict a lot of damage to your home leaving you with costly repairs. Their damage includes: chewing through wires, tearing insulation, and can leave urine on your insulation causing a bad odor throughout your home. Our experts carry a variety of humane live traps and can even get into those hard to reach places. When you contact Metro Guard for wildlife or animal control you will immediately see that we respect your property and get the job done quickly, safely and humanely.